There was a time when in answer to the question “What is your favourite MMO?” I would dive in with a resounding Planetside. It was where I found a gaming retreat for many years and forged friendships that are still going strong to this day. However the answer to that question changed as I found a new home in the form of the Rogue Isles in City of Villains. 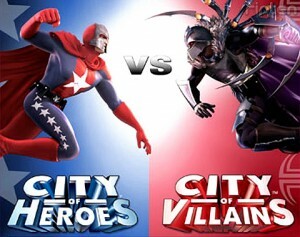 Next to City of Heroes, City of Villains was always the lesser mentioned and talked about element of the MMO. In a super hero game who wants to be the bad guy right? However it was a nice break from the normal “You are the chosen, now save the world” approach and that is what kept our interest for so long. In 30 days it will be the anniversary of NCSofts’ announcement that the City of Heroes/Villains games were going to be shut down by the end of 2012, I remember it very clearly and how I was so very disappointed. I was reminded of that time after reading a post by Bhagpuss @ Inventory Full, yesterday was the final day of Vanguard: Saga of Heroes. My thoughts are echoed back to me about wanting to play and take more screenshots in those last few months before closure, but feeling utterly lacking in effort to do so. Not through any rational thought, but the feeling of betrayal, of knowing the game you poured much of your digital soul into is going away. However games pull you back in one final time to say farewell and you take screenshot or videos of your characters and locations that remind you of the fun times that were had in the game. As Bhagpuss also mentions there are moves in place to maybe run an emulator maybe in the same way that Star Wars Galaxies has done. I do hope this happens for all the player that want to continue enjoying that digital world. For the Ex-CoH/V players there is the City of Titans game development which successfully Kickstarted a campaign to raise initial funding to build a new Super Hero themed MMO. The use of the latest Unreal engine will mean this could be the foremost superhero MMO on the market in terms of graphics. Additionally there is some movement in the Task Force Hail Mary area of the titan network. This was originally part of the multi-pronged strategy to ask various 3rd partys to buy the game from NCSoft, but efforts died down over the first year. Ironwolf is leading the charge anew, with some positive noises coming from NCSoft and other parties with regards to purchasing the game. As makes sense trying not to get too excited at this prospect, plus it’s not clear what exactly will be obtained from NCSoft if it does succeed. (characters etc). I’d like to think that on a disk somewhere at NCSoft-land all of my characters lay dormant just waiting to be bought to life once more. For all those Vanguard players, sorry your home is now gone and I hope you find another soon. That’s never a good feeling. The game definitely had its flaws and we all saw the writing on the wall, but hope is such a funny thing. That was a game with a lot of great ideas, but with somewhat superficial execution. I still hope that some team will pick it up and do it right. But that game seems long forgotten these days.